When I got up and looked outside this morning at 7 a.m. there was a heavy frost on the wooden dock. Yikes! I think last night was the coldest so far this Fall. But, as soon as the sun peeked her beautiful face over the boat sheds on the other side of that dock, the temperature seemed to rise with her, and the frost quickly melted away. It was a beautiful morning! We put on some warm gear and headed off for our run just before 11 o'clock. I hoped to run at least 8 or 9 km today as we had some CLIF SHOT BLOKS that I wanted to try... .more about them tomorrow. I made sure to carry water today. I had to wear the water belt over my jacket which felt a bit cumbersome, but I didn't want to go without it. We did a nice run along the waterfront today... the sun was shining, the sky was blue and there was not a breath of wind.... a gorgeous day and I was so glad to be out there, bouncing along. We did a 9/1 run/walk routine and ended up running 8.72 km. I know that is an odd number, but that is what MapMyRun told me! It took 74 minutes. That is about right for a longish slow run, especially considering I had to stop and pet 4 or 5 dogs and wait for one crosswalk light to change. I was really glad to have had the water along. I am a mouth breather. I need more water because of that, I am sure of it. All in all a great run. And a wonderful stretch afterwards. I am inspired to do a strength workout tonight while I watch The Biggest Loser. I tweeted Sara that I am going to do it, so now I have to! Do you exercise while you watch tv? Last night we realized that it was the 10th anniversary of the purchase of our sailboat. When we first started looking to buy a boat of our own earlier that year we drove up and down Vancouver Island and all over greater Vancouver, looking at boats. We knew what we wanted but just couldn't find it... then, in early November that year, I found her on a brokerage web site, shortly after she was listed. I contacted the broker, made an offer, made arrangements to go to Vancouver that weekend to take her out for a sea trial.... and told The Captain about it when he got home from work that night. He was thrilled! He thought I had made a really good deal and that it was good I had acted so quickly. Whew! 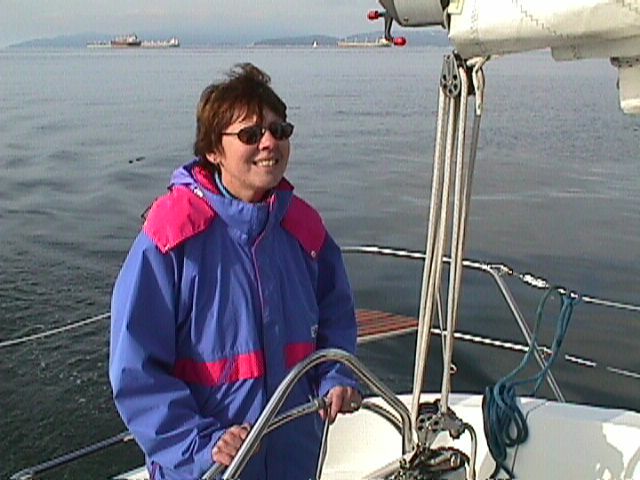 We drove 10 hours to Vancouver, did the sea trial, had all the inspections done, and a few days later she was ours... we had her taken to Vancouver Island and delivered to our marina, where we had made arrangements for a slip. Then we started coming here very often to sail and stay... and finally, about 6 months later, decided we would come permanently. We sold our house, furnished, to the first woman that looked at it... gave away a lot of stuff, packed a few boxes to bring along, and drove away... throwing away the key we still had, out the window, a couple of hundred miles down the road! The Captain taking Scout to shore for the first time ever in our dinghy. I think she didn't want to go. Look at her clinging to him! Eventually we quit making her wear the lifejacket for short trips. And we have never looked back. I think we have become nomads, actually, and love the lifestyle and freedom that we have now. Still miss my darling Scout though. She passed away, suddenly one night, about 4-1/2 years ago. Do think you might ever completely change your lifestyle? Happy 10 Year Anniversary to your sailboat and you and the Captain! I'm so sorry Scout isn't still with you to enjoy your adventures. Happy 10 years! I love that you sold your house to the first person that looked at it. I don't usually exercise while watching tv but I try to do stretches while watching. I always wondered about and hoped to learn more about your sailboat lifestyle :) I think it sounds so cool and adventurous that you decided to take the path where your heart led! Although maybe not as adventurous, when I moved to Utah I kinda did so blindly. I really had no idea where I would end up or what it would be like. However, I have made some of the best friends out here, have incredible memories and have learned a lot about myself being on my own for the first time and so far from home. It has been the best experience as I am sure your and the Captain's experience has been as well! Happy 10th anniversary!